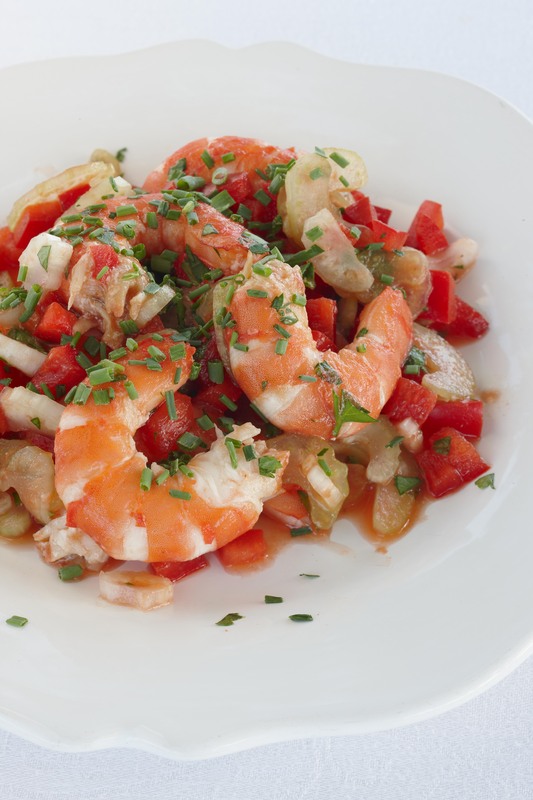 Here's a simple but elegant shrimp salad from Patricia Wells' "Salad as a Meal," featured in today's Taste section. Think of this as a modern shrimp cocktail, enlivened by a touch of fresh chives or cilantro. Protein-rich and a snap to prepare, this recipe comes from Raoul Reichrath, chef and owner of one of our favorite haunts in Provence, his Michelin- starred Le Grand Pré, in Roaix. 1. In a large bowl, whisk together the tomato juice, lemon juice, Worcestershire sauce, Tabasco, and salt. Taste for seasoning. Add the red peppers and celery. Stir to blend. Cover and refrigerate for at least 1 hour to let the flavors develop. 2. Toss the shrimp with just enough sauce to lightly and evenly coat the ingredients. Add the chives and toss to blend. Taste for seasoning. Mound the shrimp salad on plates, and serve.